At the end of the day, FCA sold a greater number of crossovers and SUV’s than any other car manufacturer in the US, with more than 100,000 sold units in March. In the 1st quarter, FCA was 18,670 units in front of General Motors and 55,034 in front of Ford. These crossover and SUV sales numbers are almost 48% of all sold March units. Jeep remained the top Crossover and SUV brand in March, defeating Ford by 9,465 units. Furthermore, Jeep sold a larger number of sport utility vehicles than General Motors and all of its brands, Toyota, Honda, Nissan, Hyundai-Kia, or Subaru. News from the Nissan front – What a great year Nissan North America had. January and February were record braking already for Nissan with another record trend in March. As indicated by the automaker’s information, U.S. sales of 163,559 for March set a “greatest month ever record,” with an expansion of 13 percent over the earlier year. The Nissan Division likewise saw a greatest month ever, with 149,784 deals, an expansion of 13 percent. These records were driven by Maxima with an expansion of 138.7 percent in sales. The Altima saw a 8.9 percent spike. Nissan Pathfinder and Rogue, too saw great sales increases of 1.4 percent and 1.1 percent. 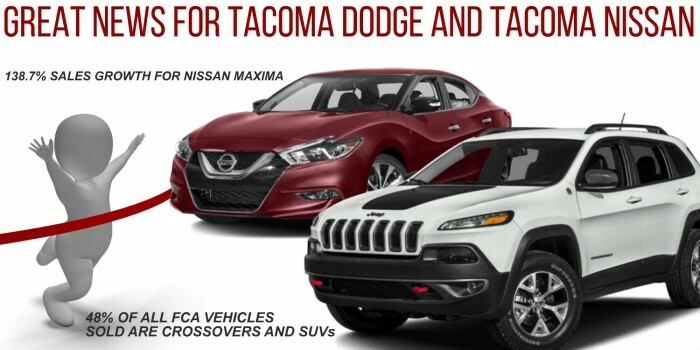 For more information on current incentives, specials and great deals visit Tacoma Nissan or for your SUV needs check out Tacoma Dodge.